"All these [European hams] can be eaten in the Italian fashion, that is with an accompaniment of melon or fresh figs, but to my mind a supply of very small pats of fresh butter (and nothing else) offers the finest partnership of all." pg 167. Buttering cured ham? I always felt people who trimmed their prosciutto fat off completely were missing out on a delicious part of the experience...but buttering up a slice of prosciutto sounds quite odd to me. Looking into the matter a bit further, I found some people do recommended this as a way to enjoy prosciutto (or Serrano, Bayonne, Westphalian hams). The notion is actually pretty thoughtful. A small pat of unsalted butter will help to mitigate the strong, salty flavor of the cured ham, plus the butter will then give the ham a longer, more pronounced finish in the mouth. Sure, calorically I doubt a cardiologist would call it "pretty thoughtful," but there was a good gustatory reason behind it. 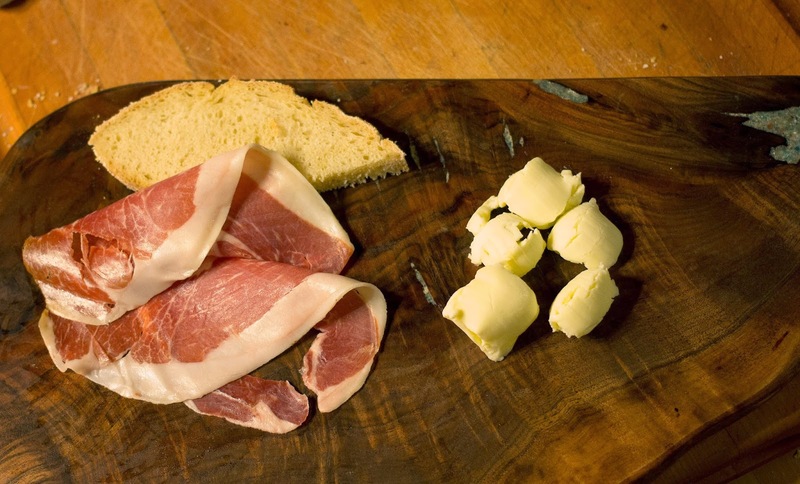 Obviously, the matter needed more study, so I decided to make up a plate of prosciutto and butter. Plus, this was a chance for me to use my fancy butter curler that I had been nagging at Carla as an "essential item" for a few weeks now. I tried the prosciutto with butter on its own, as well as on a generously buttered slice of bread. Honestly, the pairing does help give a long, savory finish to the cured ham, which was delicious. 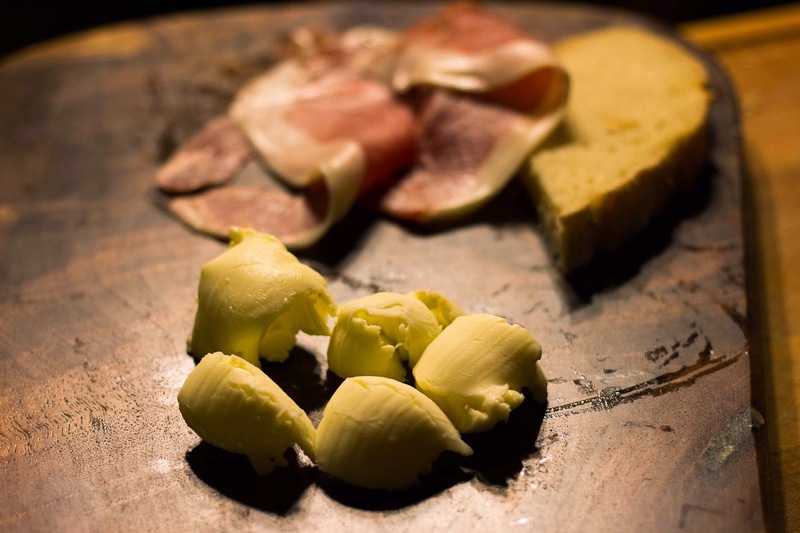 I'm not sure if the butter helps to soften the bite of the salt, but perhaps cured hams marked for export were saltier in years past before imported prosciutto and serrano ham could be purchased in most well-stocked grocers and delis. While eating a second slice of buttered bread and prosciutto, I was reminded of an old French tradition of buttering bread and topping it with cheese. This was done when you came across a wheel of cheese that had passed its peak and become a bit too sharp or acidic. In the same mind frame, the butter would help to soften the bite and tame the cheese down to a more palatable state. Perhaps this tradition inspired the ham pairing?